Thanks to the help of Willow Springs International Raceway, Beyond Wilow Speedway, Tire Express, Green Oil, and Performance Nissan we are able to do Saturday night competitions. 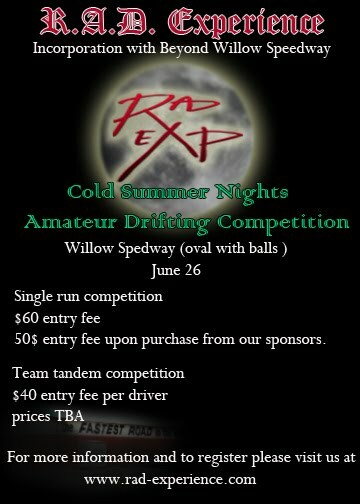 $50 Entry fee upon product purchase from our sponsors. We start at 8AM and will continue until night time (schedule will be posted soon). 8: How did you find out about us? I would like to register and pay for single run. I would like to register and pay for the team tandem.